One of the reasons why I like banking with Bank of the Philippine Islands (BPI) is because it allows me to pay my purchases in flexible ways. Whenever I go shopping, all I need to bring directly to the cashier is my BPI ATM card. My BPI ATM card is as good as cash. 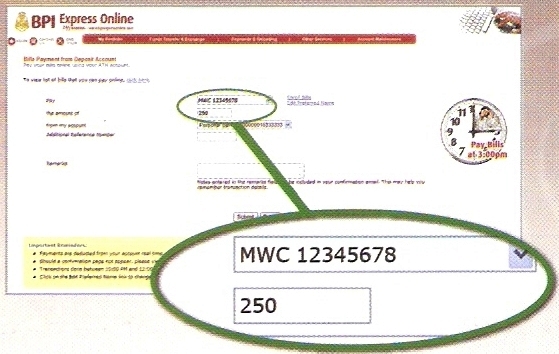 Another advantage with banking in BPI is that it allows me to pay my bills through BPIExpressOnline. 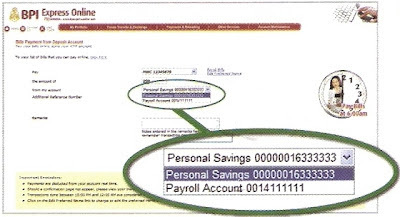 This flexible way of paying bills helps avoid the hassle of going to payment centers. It also helps me avoid my time to be wasted on waiting on long lines. 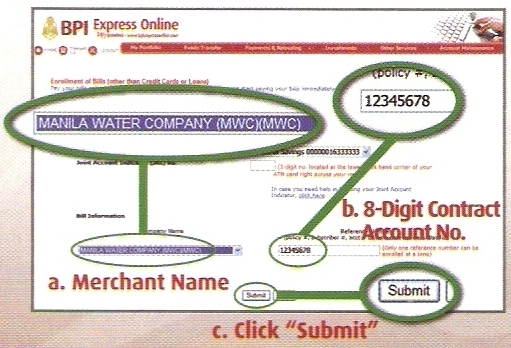 Bills payment with BPIExpressOnline makes my life easy. So how can you enjoy this easy way of paying bills? It’s easy. All you have to do is to apply your BPI savings account in BPIExpressOnline. The next step is to enroll your bills. 1. Log-in to your BPIExpressOnline account. 3. Fill out the enrollment form by providing the required information. Click “Submit” button when finished. 2. Choose the enrolled merchant (i.e. MERALCO, Manila Waters, PLDT) that you will pay. Then enter the amount that you will pay. 3. Select your BPI account where the payment will be debited from. 4. Click the “Submit” button then click “OK” to confirm your payment. You will know that you successfully paid your bill if a confirmation page appeared. So easy, isn’t it? 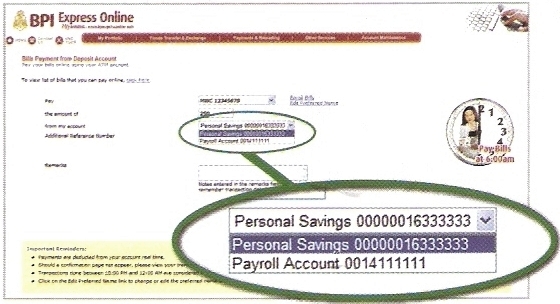 That’s why it is good that you apply for an account in BPIExpressOnline if you are a depositor of BPI. Online payment through BPIExpressOnline removes all the hassles when paying bills. If you are a forgetful type of person, then BPIExpressOnline can help you more because of its Scheduled Bills Payment Facility. This allows you to schedule, in advance, all the recurring payments. Scheduling is one-time only and can easily be done in BPIExpressOnline. This facility prevents you from missing the payment of your bills. Visit Before the Eastern Sunset and read my visit to Danao Church. Good morning po, paano niyo po malalaman na sa bills niyo po talaga papasok yung pera? magbabayad ako sa PLDT, would it be enough for BPIexpressonline to determine my bills through the reference number I provided? Hello and good morning din Anonymous. Yes. Sa bills ninyo papasok yung babayaran ng BPIExpressOnline. Yung reference number kasi ng bills ninyo ay isang unique number. Sa bills n'yo lang po iyon naka-assign. 'Yun nga lang dapat siguruhin ninyo na tama 'yung ipinasok ninyong reference number. Tingnan mo 'yung next bill mo kung pumasok nga 'yung ibinayad mo. Makikita mo naman kasi may computation naman siguro dun. Ung sa cebu pacific na nasa merchant ng bill payments nyo actuve pa ba un kasi na deduct na sa akn ung booking amount ko sa acnt ko di na ng reflect sa cebu pac. Paano maibalik ng bpi ubg na deduct sa akin. How many business days po ba bago ma post yung payment? One business day ang hihintayin para ma-post yung payment. may remittance ba pag nagbayad ka sa bpiexpressonline or this is free? I think that this is free. may 2 po kc nakalagay na number sa PLDT bills. ung first ung account number then the other Service Reference No. which is actually my phone number. so alin po ba dun ang ilalagay sa website ng BPI? 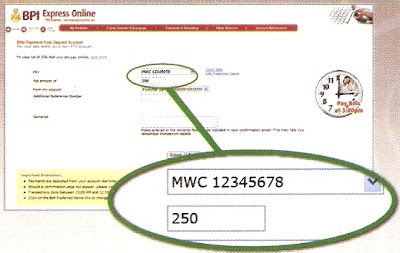 Mas mabuti po na tawagan ninyo ang customer service ng PLDT at tanungin ninyo kung ano ang ilalagay na number sa online payments. Pwede po b ang maynilad bills? Pwede po sa BPIExpressOnline yung Maynilad bills. i want to pay my booking in cebu pacific using my BPI savings account through online. what should i use as my reference number? what i have is booking number which is 12 digit number.thanks and hope you can help me with this. I looked at the list of merchant for eligible for online BPI payment. Sabi sa Cebu Pacific ay CASH ONLY so malamang na hindi magbayad online. we paid our pldt bills online and ang problem po na_double deduct yung sa bpi acct ko. who should i contact? BPI or PLDT? and pls include their toll free hotline. thanks! I suggest that you contact BPI first kasi baka yung system nila ang nagka-problema. Then contact PLDT to ask kung nag-reflect sa kanila yung double payment. Ipa-carry-over mo na lang para sa next month yung double payment. BPI Hotline: 89-100 for Metro Manila & 1-800-188-89100 for domestic toll-free calls. Toll free para lang sa PLDT subscribers.